Sri Aurobindo Ashram is known all over world as the home of Sri Aurobindo’s unique and pathbreaking Integral Yoga. Sri Aurobindo Ashram is also the Pride of Puducherry and occupies a central position in its cultural and spiritual landscape. Sri Aurobindo Ashram is administered by Sri Aurobindo Ashram Trust with five Trustees at the helm of affairs. There is no election or democratic selection process of these Trustees. Trustees remain Trustees for life and have no accountability. While Sri Aurobindo Ashram Trust is a Public Charitable Trust, it does not come under the R.T.I. As per various reports, the Sri Aurobindo Ashram Trust occupies over 60% of Puducherry’s prime real estate valued at over Rs.10,000 crores by very conservative estimates. It receives hundreds of crores in donations every year as also Income Tax Exemptions from the Central Government and various benefits from the Government of Puducherry. Over the last 10 years, there have been consistent and serious reports of violations of human rights, sexual harrasement and serious crimes against women, financial mismanagement and evasion of taxes, etc, and all in the name of God. The Trustees are involved in hundreds of legal cases all over India. The Managing Trustee is currently out on bail for forgery in a land grabbing case and the children of other Trustees are allegedly involved in shady real estate transactions involving crores of rupees in Public Funds. Annually, the Trustees spend crores of rupees in legal fees from Public Funds in order to defend themselves individually. Over the last couple of years, the National and International Media has come out with many negative documentaries on the Trustees bringing shame to Puducherry. Last year, over 75 Members of Parliament wrote to the Trustees and the Puducherry Administration demanding answers and accountability for the Trustees’ misdeeds. Recently, the Honourable Minister of Women and Child Welfare, Smt. Krishna Tirath wrote to our Chief Minister demanding strong action against the Trustees in view of the serious complaints received by the Ministry. The whole country was shocked to learn that the inmates of Sri Aurobindo Ashram cannot approach the Police or the Press regarding any matter as per the orders of the Trustees. In view of the above, our Honourable Chief Minister ordered a free and fair probe by the Collector of Puducherry into the corrupt practices of the Trustees of Sri Aurobindo Ashram. Over 50 lady inmates and other members from and outside Puducherry deposed in camera and writing and submitted evidence to the Government about the crimes of the Trustees against women and serious sexual and human rights violations. Many other inmates submitted voluminous reports about financial misdeeds and Tax Evasion by the Trustees running into hundreds of crores of rupees. After stalling the Probe for over eight months and using this period to destroy evidence and intimidate inmates into silence, the Trustees were forced to bow to public pressure and the Probe was ordered to be restarted with a retired High Court Judge as the Enquiry Officer. However now the Trustees have used large amounts of money from the Ashram’s coffers in employing the most expensive lawyers in order to mislead the Honourable High Court of Chennai. They have deliberately and by providing false information ensured the change in the terms of reference of the Probe and its very nature in order to manipulate the result. The Probe is now open to inmates and ex-inmates of the Ashram only, thereby denying the fundamental right of the Public of Puducherry to participate in the Probe! This will not make the Probe free and fair and is against the spirit of proper enquiry! It should also be noted that most of the sexual harassment cases involve non-inmates and this would allow the Trustees to go scot free! Additionally, the Public of Puducherry and beneficiaries of the Ashram Trust from outside have been denied the right to participate in the Probe, thereby depriving them of their basic right as envisaged by the Divine Mother. The Trust Deed clearly states that all disciples, devotees and followers of Sri Aurobindo’s philosophy and ideals are beneficiaries of the Trust and share equal responsibility and participation as inmates. In a most shocking development, the Govt of Puducherry, which had initiated the Probe in the first place has been barred from participation in the Probe. This will result in the Trustees having a free run and manipulating the results of the Probe. Moreover many of the major financial irregularities involving the Trustees can be brought to public knowledge only with the participation of the Govt of Puducherry. This is totally unacceptable. 1. Ensure that there is no deviation from the original Terms of Reference of the Probe and that all the beneficiaries are allowed free participation without discrimination. 2. The Govt of Puducherry must remain a fully empowered participant in the Probe. 3. The Public of Puducherry cannot be denied their right to participate in the Probe. 4. All the complaints against the Trustees involving intimidation and threat in gross violation of Court orders must be dealt with and the guilty punished before the Probe can proceed. 5. The Trustees must bear the legal expenses of the helpless inmates who have to run to the High Court of Chennai for repeated clarifications involving the Probe. The Trustees use Public Funds to defend themselves individually and are also paying for the expenses of the Enquiry Officer and all other costs of the Probe. Therefore it is only fair that they pay for the legal expenses of the inmates in connection with the Probe. Otherwise the poor inmates are harassed and are unable to bear the cost of seeking repeated clarifications from the High Court in Chennai. 6. Immediate appointment of a senior I.A.S. Officer as the administrator of the Ashram in line with the functioning of the Auroville Foundation and Tirupati Devasthanam. 7. Thiru Ashok Anand, M.L.A., visited various departments and premises of the Ashram on 23 October, 2013 along with the Enquiry Officer in order to have a preliminary assessment of the situation. Thiru Ashok Anand highlighted to the Enquiry Officer and the Trustees that it is improper, illegal and immoral to house hundreds of lady inmates with male inmates in adjacent rooms with common toilets in the same buildings. Thiru Ashok Anand pointed out that it is nowhere permitted to house unmarried male and female inmates in the same complex and this encourages sexual harassment and abuse of helpless women. 8. Thiru Ashok Anand has assured the Public of Puducherry that their grievances in connection with the Probe will be conveyed in a proper manner to the authorities and that justice will not be denied to a single beneficiary of the Trust. 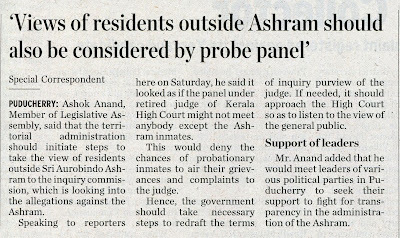 PUDUCHERRY: Ashok Anand, Member of Legislative Assembly, said that the territorial administration should initiate steps to take the view of residents outside Sri Aurobindo Ashram to the inquiry commission, which is looking into the allegations against the Ashram. Speaking to reporters here on Saturday, he said it looked as if the panel under retired judge of Kerala High Court might not meet anybody except the Ashram inmates. This would deny the chances of probationary inmates to air their grievances and complaints to the judge. Hence, the government should take necessary steps to redraft the terms of inquiry purview of the judge. If needed, it should approach the High Court so as to listen to the view of the general public. 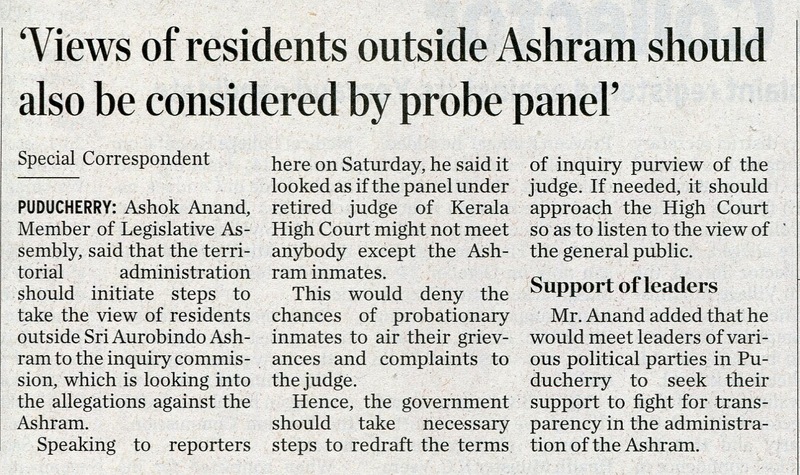 Mr. Anand added that he would meet leaders of various political parties in Puducherry to seek their support to fight for transparency in the administration of the Ashram.